Photos of the arrival of pollution from the Prestige on the French Atlantic coast. 31.01.03 The strong northern wind drives oil onto many Spanish Basque beaches, particularly those near Bilbao, nor is the south Landes coast spared. 150 Spanish and 15 French fishing boats, together with specialist pumping vessels, will have to wait for the weather to improve before returning to work. More than 500 people in Gironde and 350 in Les Landes continue to clean the beaches again. 30.01.03 Bad weather conditions, with winds of 80 km/hr or more, have stopped marine cleanup and observation flights. 29.01.03 France: The strong north-west wind brings lumps of oil to the French Basque coast, in particular the beaches of Biarritz and Bidart, a bit further south. Professionals continue the clean-up operations along the Aquitaine coast-line, while a flotilla of ships and boats from European countries go fishing for oil; when the sea conditions permit. Up to 1000 tonnes of emulsified oil have been taken for the sea in the last three weeks, and destroyed by incineration, along with the 100 or so tonnes of oiled rubbish collected from the beaches. But each tide brings another load of tarry lumps somewhere along the coast. Spain: Thousands of volunteers still keep cleaning the rocky beaches. Current estimates are for many months, years, or even never, for cleaning up the mess. Meanwhile, the current fissures in the wreck of the Prestige may have been nearly all blocked, but new ones are appearing as the tired metalwork corrodes. 24.01.03 France: Oil from the day that the Prestige sunk has now reached southern Brittany, more than a thousand kilometres away, according to LASEM (the marine laboratory based at Brest). This oil is now dispersed over hundreds of kilometres of sea off the Atlantic coast. It is impossible to predict where, or when, oil will come ashore. Beaches in Vendee, Gironde and Les Landes have again received lumps of oil. Spain: Spains environment minister says that Galician beaches are mostly cleaned. From next week, the rock cliffs will be cleaned with high-pressure hoses. The washed-off mess will be prevented from returning to the sea by barriers and absorbent material. 23.01.03 France: reduced in size by clean-up ships, the pollution offshore stays about 50 km off the Gironde coast. However, the remaining oil is too dispersed to be collectable, even though, currently, the seas are calmer. Yet more lumps and pancakes have been washed up by the strong tides, requiring another round of cleaning. This oil comes from the original sinking of the Prestige, not from the later escaping fuel oil. 18.01.03 France: As beaches are cleaned, the next tide brings another wave of lumps of fuel oil, particularly on the Gironde coast. Although larger bits wash out again with the next tide, today 50 volunteers meticulously collected tonnes of oil and polluted kelp, helped by mechanical sieves pulled by tractors. In all 8 tonnes of muck were removed. Since the 6th January, 580 tonnes of pollution have been collected from the waters of the Gulf de Gascogne/Bay of Biscay. Although predictions expect the slick to drift north-eastwards, it is not clear if, or when, this will happen. Spain: The coasts of northern Spain are still blackened by thousands of tonnes of oil, and still being cleaned by thousands. With calmer seas, the submarine Nautile has now stopped up eleven of the 20 leaks from the Prestige, 3500 metres beneath the Atlantic ocean. 1 tonne of fuel now escapes each day. This temporary fix should be completely in place at the beginning of February. 14.01.03 Yesterday French trawlers recovered 18 tonnes of oil, while two ships, Dutch and Norwegian, pumped 65 tonnes from the seas, about 300 km from the Gironde coast. But these quantities are not comparable to the quantities of oil still escaping from the wreck. To gain some appreciation of the scale of this disaster: The quantities collected in France are minute relative to the 20,000 tonnes, at least, known to have escaped from the sunken tanker off Spain and now floating hither and thither. Further, 80 tonnes or more are trickling out of the wreck each day, destined to expand to at least 400 tonnes of emulsified mess. Yet already, over 1,000 peoplevolunteers and military and municipal personnelare working to clean the Aquitaine coast. Over 100 miles of beach and access are closed off to the public. Since the beginning of the clean-up operation, the French have destroyed a mere 325 tonnes of oil-contaminated refuse, and a further 25 skips of muck have been stockpiled. Barrages have been placed across the entrances of ports and the exits of rivers all along the coast. 14.01.03 Despite half the twenty leaking fissures in the sunken wreck having been patched, 80 tonnes of fuel oil a day still leaks out and arrives on Spanish coasts, where Dantesque lines of white-clad military and volunteers struggle to remove the gunge. 60,000 birds have been killed from the pollution, of which only 1,000 have been saved. A French trawler with special fine nets has caught 8 tonnes of oil in the open sea, while another 100 tonnes has been pumped from the water. 13.01.03 It would be highly desirable that the clean-up of the Arguin Bank in the Arcachon Basin be completed before the several thousands of nesting terns return to the nature reserve area. 70% of Europes Brent goose population also nest here. There is also the strategic matter: lumps of oil not cleared up will go out wth the tide, only to return and pollute somewhere else, perhaps less accessible, on the next tide. 12.01.03 139 civilian volunteers helped clear kilometres of Gironde beaches yesterday, under watchful professional supervision. The French are being careful not to repeat the mistakes of the Spanish where hundreds of untrained and ill-equiped helpers have had to be treated for oil-related health problems. Eating oysters from the Arcachon Bassin is banned, as a precaution, though the oyster cultivators are angry, saying the shellfish are not being touched by any of the pollution. Calmer weather is allowing the fleet of clean-up boats to clear some of the oil still off-shore. It is far better, if possible, to remove oil pollution from the sea, before it can reach the shore. On land, the task is much more arduous. Winds are still holding the larger oil pancakes away from the coast. 09.01.03 The wreck of the Prestige, 130 miles off North Spain, is still leaking 80 tonnes of heavy fuel oil a day. 120 km of the French Atlantic coast now have received oil pollution, mostly known to come from the Prestige. 150 tonnes of polluted waste have been collected, so far, from the Gironde coastline, including in the Arcachon Basin. Clean-up has to be done speedily before the lumps of oil are buried by sand or swept further north by the next tide. The current wind holds the main slick away from the coast. 04.01.03 Small lumps of semi-solid oil stretch along the beaches of Gironde and Les Landes, from the Archachon Basin in the north to Moliets in the south. Access to beaches is forbidden, while professionals, rather than volunteers, work on the cleanup. The large dispersed slickcontinues to near the coast, though a change in wind direction is predicted. The small lumps are from oil leaked while the Prestige was towed up and down the Spanish coast, while the slick is the oil that leaked from the Prestige when it first sank. 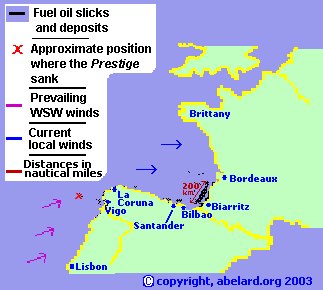 02.01.03 Oil from the Prestige has now started arriving on the French Atlantic coast, scientists confirm. As yet, only small patches and pancakes of tar are being cleared, using the mechanical sand sieves usually deployed to clean the beaches for summer holiday-makers. However, the mechanical sieves are having difficulty collecting the little sticky black lumps, so local military personnel follow, collecting bits by hand. This will be repeated each time the tide recedes, leaving more oil behind. 01.01.03 Small lumps of oil have been found (and cleared up by local firemen) on beaches in the departments of Les Landes and Gironde, including at Biscarrose, in south west France. Analyses on their provenance are in course. About a hundred birds, mostly protected sea species, have been found on the Pyrenees Atlantique coast, soiled with oil and no longer able to fly or escape the sea voluntarily. They are taken to a sanctuary at Biarritz be cleaned, then to recover in warm, darkened rooms. Only about 10% of birds touched by oil in the sea will survive. A local naturalist said that fouled birds always precede the oil slicks. There is some scaremongering in the article, but it remains a wake-up call for oil substitution (oil substitution includes conservation by improved efficiency). Also see oil and nuclear archives at abelard.org (note: nuclear included under energy archives). This item is just one among many that shows the increasing awareness and response to the approaching changes.The article is insufficient but it is a start. Note that the headline figure of 25% is a mere 8% overall increase on the present levels, and that it is planned over 10 years! Further be aware that most government promises and projections tend to be self-serving rubbish. Oil from the Prestige is heavy fuel oil. It has low volatility so it hardly evaporates. It has a very high viscosity and so tends to form a stable water-in-oil emulsion that can persist for weeks in the sea, and form hard asphalt pavements on beaches if not removed. The water-in-oil emulsion can increase the volume of pollutant by up to five times, that is making a mix of one part oil to four parts water. Obviously, that volume will increase further as rubbish and sand are mixed in by the seas agitation and as the mess is beached. However, confirmation that oil pollutant will increase by as much as ten times has not yet been found. The source for information given here is The fate of oil pollution (an pdf file), from the International Tanker Owners Pollution Federation. This news item has been incorporated into the Fossil fuel disasters briefing document.